The eponymous Sea of Thieves is full of secrets, Easter eggs, and one big Kraken, but you don't need to set sail or even log in to see this one. Players discovered there's more to the start-up screen for Sea of Thieves' beta client than you might think (even though the "scale test" won't go live until Thursday): try to play and you'll get an error message that tells you the game isn't live yet, but you'll also see the background image shift just a bit. Repeat this process long enough and you'll see a series of illustrations and text snippets that explain Sea of Thieves' buccaneering backstory. In other words, it looks like Rare snuck the game's intro cinematic into the beta client to give bored players something to do while waiting for it to come online. How thoughtful! If you have the client downloaded, you can see it yourself, but YouTuber Wally17 already spent 10 minutes of their life mashing the "A" button so you don't have to. Here's the cinematic text in full for all the lore hounds out there. It's rendered in rhyme, because pirates love poetry almost as much as they love pillaging. The fifth, sixth, and seventh lines reference the three Trading Companies players can work for in the full game: the Gold Hoarders, the Order of Souls, and the Merchant Alliance, respectively. The last line hints at the goal of becoming a pirate legend that Rare mentioned in our recent hands-on preview with Sea of Thieves. 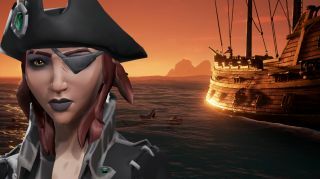 "As their names become famed and their status ever more celebrated, well-practised pirates tend to set their sights on an even greater goal: tracking down the fabled Athena's Fortune," as the game's official site explains. Fun fact: Sea of Thieves' internal project name is Athena, which makes this fortune sound even more important to the overall experience. Still, I'm equally excited to find more fun little Easter eggs like this hidden cinematic once the game finally comes out.